No absolutely not. This is a common misconception that people get due to the shiny color that many reptiles (mostly snakes) have on their scales. This shine is believed to come from special oils in the scales and not from any slime. Are reptiles slow and stupid? How Many Different Forms of Reptiles are There? According to the TIGR Reptile Database, as of February 2008 there are approximately 8,734 recognized species of reptile on the planet. They are divided into four distinct orders. The CROCODYLIA which comprise 23 living species. The CHELONIA (turtles) which comprises 313 species. The the SQUAMATA which is supdivided into the LACERTILIA or lizards at 5,079 species, the AMPHISBAENIA or worm lizards at 168 species and the SERPENTES which are the snakes. They comprise 3,149 species. Finally we have the RHYNCOCEPHALIA which is New Zealand's tuatara. There are only 2 living species. Yes and no. It depends on the species of reptile kept. It also depends on how old the animal is and it's individual personality. For instance one would have a much better chance of taming a young Nile monitor (Varanus niloticus) than they would an adult. Some animals will respond readily to people while others will never become fully tame. I believe that any reptile (and any animal for that matter) can make a good pet, if it's treated right, have all of it's needs fullfilled, and raised from a baby. The last bit is very important since younger animals seem to adapt to strange hominids wanting to wait on them hand and foot a lot faster than adults who have been taken out of their wild habitat. Still I would only recommend having a reptile as a pet if you know a lot about the animal's natural history and are prepared to replicate it's environment to your fullest extent. Is there a difference between a herptile and a reptile? This is a rather strange word; herptile. The name is meant to include the reptiles and the amphibians in the same category. I honestly don't know why we do that in the first place, since reptiles and birds would be better to classify together, since they have more in common. At any rate the answer is yes. Herptile includes amphibians and reptiles. For as long as people have known about the existence of reptiles and amphibians, they have been confusing the two. The funny thing is that it's very easy to tell a reptile apart from an amphibian. Reptiles have scales. Amphibians have smooth skin (although some are warty). Reptiles are total land animals. Amphibians need the water. And yet this is not always true. There are many marine reptiles, but they must go ashore to lay their eggs, well the sea snake might be a possible exception there. There are also amphibians that are able to spend their whole lives out of the water. They are rare, but there. The real big difference (other than scales) is that reptiles use hardshelled, amniotic eggs for their babies. All amphibians have soft jellylike eggs. Well the commonly used difference (which is kinda illustrated here) is the snout shape. 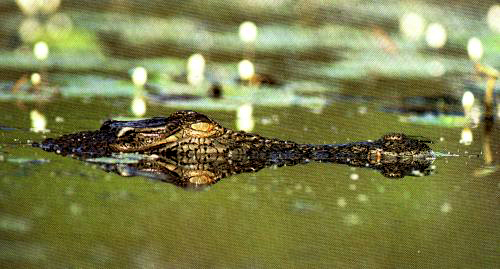 Alligators generally have wider and smoother snouts, while crocodiles have more triangular and thin snouts. But this isn't always true and some fossil crocodylians have snouts that can get confusings. 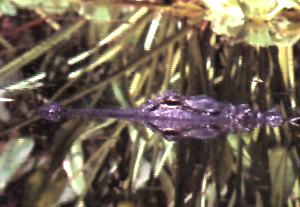 For instance there is a species of now extinct caiman with a snout nearly as thin as Tomistoma schlegelii (the false gharial). So how does one really tell the difference? It's all in the teeth. Alligator and caiman bottom teeth fit snuggly in the roof of the mouth in special pits. In crocodiles these teeth fit into special grooves on the outside and thus end up showing when the mouth is closed. For more on this head to the crocodylians section. Can you really hold an alligator or crocodile's mouth shut with your bare hands? Yes and no. Apparently it has become common knowledge to know that a crocodlyians jaws are all geared towards chomping down. This gives the animals extreme biting power. But, the muscles that open the jaw are relatively weak and can easily be held closed. Now this saying has always been applied to crocodylians. But you know what? This also applies to all animals with jaws. Every single jawed animal in the world has it's muscles geared towards shutting. The muscles used for opening are always weaker then the closing muscles. Why? Because the job of jaws is to tear up food. Since food can be hard to tear apart, animals have evolved jaws that can handle this. Now since all the damaging aspects of jaws are in shutting most of the muscles have been geared towards delivering lots of power in the closing. Now since no animal tears up food by opening it's jaws, the need for strong opening muscles has never arisen and therefore never evolved. For an example of this just try it out on yourself. Put one hand on your head and the other hand below your chin. Now try to open your mouth. You should find that, even though there is tension, you could probably hold the jaws shut. Now try the exact opposite. Open your mouth and stick your hands in to prevent it from closing (NOTE: Don't let a friend do it for you. No sense losing a finger). Now attempt to close your mouth. When you are done compare the two. Which was easier and which was harder? In most cases you should find it easier to shut your mouth than to open it. Note how much more power your jaws exerted when trying to close compared with trying to open. If one is careful, and can find a dog willing enough, then one can perform this same test on their pet dog. The results will be the same. A final note on holding crocodylian jaws shut. It's best not to try, since a large crocodile can easily knock you off when you try to hold it's jaws shut. Crocs have powerful neck muscles and tend to roll about and thrash when restrained. This makes them very dangerous for such a strange exercise. Can I outrun a crocodile? Depends on the croc, distance and area. If your in the water then no you cannot outswim a crocodile. If your near the water or the crocodile then no they are very good at closing in from a short distance. In fact it helps to be at least 10 ft away from the animal if you hope to outrun it. Now you can outlast it in a run since humans usually have a higher running endurance than crocodiles. So in many cases no a croc will get you, but if you are far enough away then yes you can outrun them. Although it is a rare event to get chased by a komodo dragon (Varanus komodoensis) that is interested in you for supper, if it does ever happen then you are in quite a pickle. Komodo's have strong powerful legs that can excellerate them into speeds of 10+ miles an hour. Plus when running they hold their bodies stiff which, allows them to breathe and run at the same time; this increases their endurance. Now if you had a good 20 ft headstart you could be OK, but since these guys usually don't get into a run until they are 5 ft from you, it's pretty easy to see how you can be easily beaten in a sprint by them. You can outlast them in a run, but no you cannot outrun them. Luckily having one chase you is a pretty rare event. No, only cartoon turtles can come out of their shells. In real turtles, the shell is a part of the body connected to the backbone and ribs. A turtle coming out of it's shell would be a very messy thing indeed. For more on turtles & tortoises check out the chelonian part of the site. Do snakes "sting" with their tongues? No snake tongues are forked so that they can fit into a special smelling organ in the mouth called the Jacobson's organ. It has two pits in it, which is why a snake's tongue is forked. No snake stings either. Some inject venom, via specially grooved fangs. Some in the front, others in the back. Not all snakes are poisonous, many of them are rather safe to be around. So no, snakes can't sting with their tongues. Is an anaconda bigger than a reticulated python? While Python reticulatus may hold the record for the longest snake (10 meters or more), the green anaconda (Eunectes murinus) still retains the record for being the largest. Anacondas are big snakes, everything about them is big. This is no doubt related to it's diet which consists of anything from small rodents to peckaries and caimans. But just how big do they get? Well the largest recorded specimen was over 11 meters in length making for one massive animal. Reticulated pythons can also reach such impressive lengths. Not only that but they can also exceed said lengths, but an 11 meter retic is easily dwarfed compared to an anaconda of the same length. This extreme size difference can be seen (er..heard) in an account by Herpetologist Raymond Ditmars who described a 5 1/2 meter anaconda with the same proportions as a 7.25 meter reticulated python. If you have any general questions on reptiles and would like to have them posted then just E-mail them to me and if they are relevant then I will post them up and give you credit for them.